As a follow-up to the roundtalk featuring the show’s chief animation directors, here’s a translation with SAO’s director – one of Mamoru Hosoda’s pupils, Tomohiko Ito. – Looking back on the production of SAO, how do you feel about the show? Ah, I was fortunate to have a great staff. Also, I’m very grateful for the people who gave me the chance to work on a show like this. – When you were first in discussion to become the director, you were a bit perplexed about taking the job, right? – After you had accepted the position, what did you consciously insert into the production process? 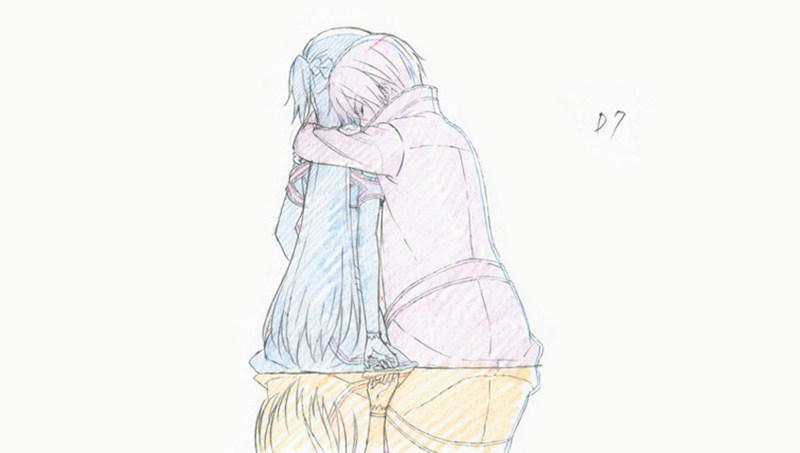 – What was important for you to include in the composition of SAO when it was being adapted? Although the novels are an ongoing series, since volumes 1 and 2 have their own stories which are then finished in volumes 3 and 4, you could treat the anime as the tale of Kirito and Asuna. That’s why we structured the Aincrad arc in chronological order. It would give a different impression compared to the novels, but wouldn’t there be a lot of benefits to arranging it in this order? – After you decided on the structure of the show, what points did you stress and insert into the scripts? Awareness of the distance between Kirito and Asuna. Since Kawahara-sensei wrote them at different times, it influenced their emotions. When you re-arrange them in chronological order, their feelings shift a bit. Also, Asuna has a forceful approach when she appears in novel 1. With a novel, you can use other text like details or explanations to convey her feelings, but that’s difficult to depict in an anime. Due to that, I thought we could give a different perspective by portraying that distance between them from the very beginning. – By the way, what was the reason you went with a lineup of 2 chief animation directors and 2 action animation directors? We went with 2 chief ADs due to a production type decision. And since I’m weak on action animation, I requested that we build the staff with an action animation director. I would show the storyboards for the action scenes in each episode to the action animation director and then insert their corrections in my storyboards. – What did you have in mind when creating visuals of a virtual world and what difficulties did you encounter? I wanted to create something different from the game worlds and fantasy worlds that we had seen previously. After all, there was already a precedent of a title with a virtual world in anime called .hack. There was an entertaining 3DCG movie called .hack//The Movie released before SAO. Since it was 3DCG, you could attach things to the characters like a status display or icon above their heads. 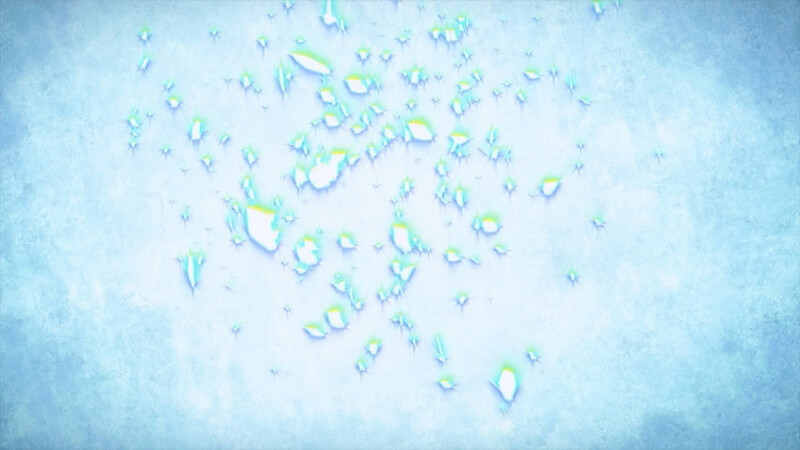 Since it would be annoying to show that in every scene, we would show it only when we would go from someone’s point-of-view in SAO or when it was necessary to show an icon in the game world. We approached that similarly sound-wise. We usually had live sounds (nothing synthetic) in SAO, but sound effects staffer (Yasatuki) Konno-san was fixated on creating a game-like sound for that, so it would pull you more into a virtual world-like setting. – What did you do when designing props and such? We wanted to make sure we didn’t use things like cups from the real world. We would look at visual books for movies like the Lord of the Rings series and based a lot of designs for props and people that would only appear in one cut. Though I thought “it would be nice to have a lot of money like Hollywood has,” they were good references for the type of props we wanted to make. – Though they appeared in real world scenes too, you also depicted food in the virtual world. – What orders did you give to art directors Yusuke Takeda-san and Takayuki Nagashima-san? I just gave them some kind of vague description like “I want to get a virtual world-like feeling for things like the boss rooms.” I pondered if would it be better to have some game gadget points in the world, but I fundamentally left it up to those two to do what they wanted while consciously creating beautiful worlds. In the novel, the floor above the one you’re on in Aincrad is at most 100 meters above you, so that would be difficult to depict visually. Thus we wanted to give it a sense that it would be so high that you couldn’t see it. The cities on each floor have a different atmosphere, but it’s definitely a fantasy world, so wouldn’t it be alright to insert a little bit of medieval European atmosphere in them? Also, I focused on the sun. I wanted you to be able to tell it was different from the real world with one glance. I have a feeling that this doesn’t happen in other anime, so I can brag a little. (laughs) For example, if you see there are two suns, you instantly know “this is not Earth.” I thought it would be important to present those differences from the real world. – Please tell us about casting. What was the reason you chose Yoshitsugu Matsuoka-san as Kirito? Matsuoka-kun is usually docile, but doesn’t he become very manly when he shouts? I thought that difference was quite fun. I felt he fit the character of Kirito in season 1, so I asked for him to play the role. Since then, I’ve been asked by other magazines “did you foresee season 2 when casting Matsuoka-san?” Kirito gets a feminine avatar in season 2, so they think he was chosen because he can produce a higher pitch voice like a woman, but that wasn’t my intent at all. He’s very serious. I have to talk to him to get him to calm down at the recording sessions because he’s studying so intensely. I wanted the female characters to feel like they have a strong core. I especially asked Silica’s actress, Rina Hidaka-san, “I want you not to sound like you’re trying to flirt with him.” Silica was someone who Kirito arbitrarily saved, so I wanted her to be someone who sang his praises. If she felt like she was trying to flirt with him, then she’d certainly become a dislikable character. Especially to me. (laughs) I’m grateful to them all for giving performances that responded to my orders. – And Yuki Kajiura was in charge of the music. This was a proposal from (chief producer Atsuhiro) Iwakami-san. Kajiura-san has been active recently with Puella Magi Madoka Magica and Fate/Zero, so I wondered if her music would suit the somewhat SF game world of SAO. I immediately listened to all of her CDs. (laughs) Among her work was the soundtrack for Xenosaga Episode III, where a somewhat fantasy-like piece hid inside a solemn track. I thought it was great and that if we went with that type of sound, it would work. When I met with her, I mentioned the point of the song that I liked and she said “I understand. I’ll think about going in that direction.” And then the first piece she made was used in the 4th PV, a mix of “aincrad” and “swordland.” That piece was solemn as well and due to how serious it sounded, it added a dramatic atmosphere to the PV. – What sound effects did you focus on? If you’re making a virtual world, you need to have sounds like fairy wings flapping. I spoke with the staff about wanting to make the sound effects feel like they’re from in virtual world, yet based on sounds from on real life. Essentially, Swara-Pro, the company that sound effects staffer Yasayuki Konno-san works for, attached live sounds to the video. The sound effects for footsteps weren’t from this perfect man; they were recorded newly just to match the video. You have to do that to bring out the nuances of the drama and make the visuals feel more atmospheric. For example, the first sound that we put in when Asuna is eating the bread in episode 2 sounded considerably delicious, so I requested, “please make that nastier.” (laughs) After all, that bread isn’t tasty to begin with; that’s why you eat it with cream! On the other side, we added tasty sounds to Asuna’s sandwiches; things like the sound of chewing crisp lettuce. – The sound when a player dies, the “blish” of glass breaking is easy to understand. How did you come up with that image? I remember ordering a “something that expressed the feeling that someone died” so that kind of sound was given to me. We didn’t want to use other threatening sound effects like boom! for that. There’s an implication there that we wanted to avoid game-like elements like displaying icons, but I wanted to reconsider using general direction for SAO. They’re easy to understand, but I kinda feel like people are somewhat used to them. I brought up to the staff “Isn’t this kinda dull? Let’s reconsider our thoughts.” (laughs) A lot of ideas came out from editor Shigeru Nishiyama-san, sound director Iwakami-san, and sound effects staffer Konno-san. – I’d like to ask you about the editing for the show. The spacing between lines is rather short. What did you intend with that? A big reason was quite simply we had space between the lines. I don’t like the way that anime chatter sounds. Rather than just using the length of the lines for a cut, I like to split them between different cuts. Of course, it all depends on the situation and character too. Especially with the lines for female characters. If you record their lines plentifully, then don’t they become overly cutesy….. Changing the presentation like that affects how the character and the work itself appear to the viewer. – What else did you consider on the direction side? – Director, it feels like you’ve restrained yourself from overdoing scenes. I love the movie director Alexander Paine since he filmed Sideways and The Descendants, but he’s a person who consciously films with a camera two steps behind. That’s why he’s the type of person who can see someone’s sorrows as comedic. Someone who brings the camera somewhat closer to film is Wes Anderson. If I want to show something from that position, I use those details. Araki-san is the type who’d say “Closer! Closer!” I think about if these people were handling SAO, what would they do? – By the way, you checked over every scene as series director. What scenes in particular made you think “this is amazing” when you saw them? I’ve mentioned this here and there before, but anything where I pushed things forward without coming in touch with them…. Veteran animation Jun Arai-san handled the scene in episode 2 where Illfang The Kobold Lord knocks Diavel away. When I saw the image, I thought it was very bold, but I felt it would look very cool when it became the final visuals. By the way, the wakame shadows that appear only in that scene were a tic evolved from Yoshinori Kanada. (laughs) In the same episode, the moment where Agil runs towards the enemy and the music picks back up is the point where I was personally moved. – What about in the ALO arc? Oberon’s strange faces. (laughs) We didn’t notice it at all during production, but when it was coupled with the performance by Takehito Koyasu-san, we said “So it turned out like this…” and our mood got lifted. Of course there’s highlights where I asked skillful animators to handle those parts. The action ADs, Shikama-san and Yanagi-san put a ton of fighting spirit into their work, but it was relatively harmless cuts that I felt “Oh, this is great, this is great” when I saw them. Again, around Oberon, but the point where he grovels and whimpers and Kirito shamefully swings Excaliber in episode 24 was great. – By the way, you taught a director course after production finished. What did you teach there? 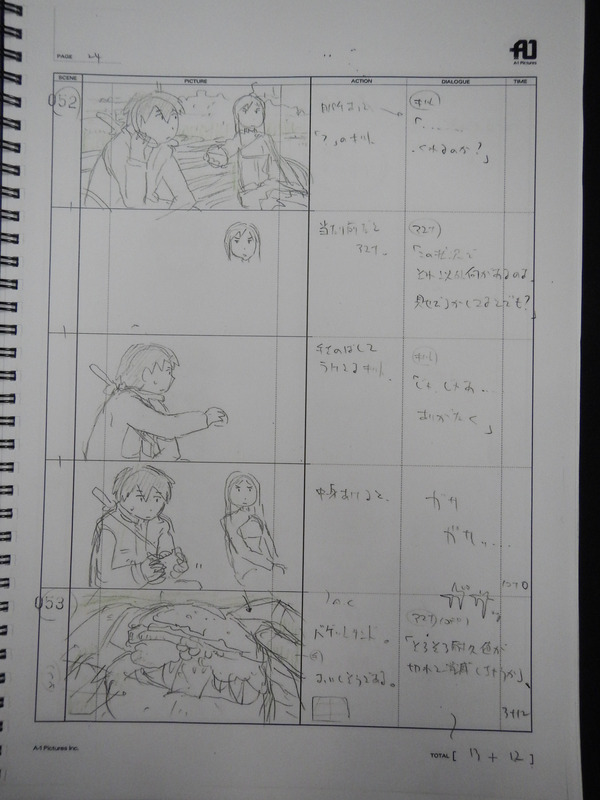 Tomohiko Ito’s own storyboard for Sword Art Online episode 6. What does director Ito think SAO’s appeal is? 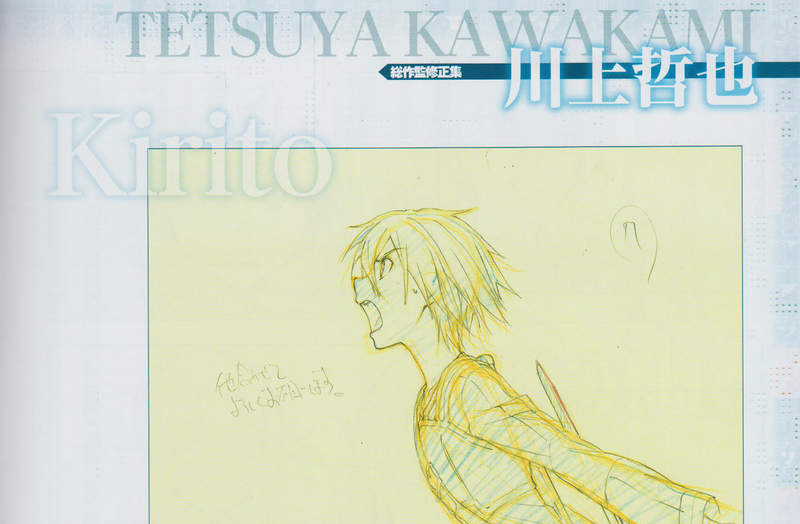 – It seems Kirito’s character is in a position between where Kayaba and Asuna are. He’s in some kind of spot around there. Originally he respected Kayaba a lot, and he won’t speak poorly of the crimes he committed. I feel like Kirito is unaware of the implications and unsure if Kayaba being blamed for imprisoning 10,000 people in a virtual world and having several thousand killed is fully right or wrong. – And that continues resounding in the second season too. That’s right. Kirito undertakes a new job that gives him awareness of what Kayaba did. At one point Kirito himself killed some people. He stopped thinking about his victims, but a new development in season 2 brings his attention back to them. – What do you think the reason why SAO has become such a hit worldwide with manga and games also becoming very popular? This is difficult to say… When I first saw the characters, I thought “they’re really pure,” so the general audience probably sees something like that too. It might be a different reason when it comes to what international audiences took from it. I went to an event in the US and heard “I’m glad there was a fighting heroine like Asuna.” Something as straightforward as that lets you understand why Americans love women like Asuna. Also Agil is popular. (laughs) Since there’s popular breeding grounds for MMORPGS internationally, perhaps seeing flashy people fighting doesn’t feel unnatural. – So what do you think the appeal of SAO is? Interview originally published in 『ソードアート・オンライン』ノ全テ, which you can still purchase on Amazon JP and similar stores. Thank you for those translated interviews! I hope they keep coming. Sadly, this is the last one for SAO. There were only three in this book; the two I’ve translated and one with Yoshitsugu Matsuoka that I didn’t feel would be interesting enough to work on. If Dengeki releases another one, I’ll definitely work on the ones from there. We’ve still got some in the bank for A Silent Voice, but I’m really busy IRL, so nothing’s been done on anything else.